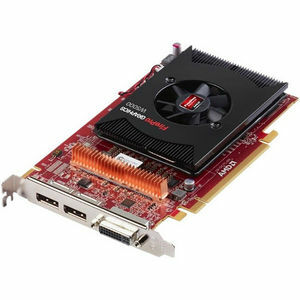 AMD FirePro™ W5000™ is the most powerful midrange workstation graphics card ever created, delivering significantly better performance than the competing card against a wide set of measurements. For example, it has the ability to process up to 1.65 billion triangles per second, allowing a designer to easily interact and render 3D models, while the competing solution is only able to process up to 0.41 billion triangles per second (up to 4 times less). In addition, with double the graphics memory (2GB vs 1GB of the competitor) and a memory bandwidth that is up to 2.5 times faster than the competitor, moderately complex models will be no match for the AMD FirePro™ W5000. It's the ideal solution for professionals working with a broad range of applications, moderately complex 3D models and datasets.